Have you been amazed by a net-like cloud formation in the sky? That cloud formation is known as lacunosus clouds which have gained a significant number of aficionados among cloud spotters and photographers. Learn more about this rare and amazing cloud formation. Lacunosus clouds are clouds that have holes and irregular edges akin to like loose honeycomb. They are visible in the three atmospheric levels but are very common in middle and high altitude levels. The term lacunosus is a Latin word derived from lacus meaning “lake” and lacuna meaning “hole”. Lacunosus clouds are rare and short-lived cloud formations which is why they are sought after by photographers and cloud spotters. What Height is Lacunosus Clouds Found? Lacunosus appears in low, middle and high level altitudes. If they appear with low level clouds, they are found less than 6,500 feet above the ground or up to 23,000 feet for middle level clouds. If they appear with high level clouds, they are found more than 23,000 feet from the ground. Depending on which cloud level it appears, a lacunosus cloud can be primarily made up of water droplets, ice crystals or both. Lacunosus clouds are forms of cumuliform clouds. Cumuliform clouds are clouds that show vertical growth that resemble towers, mounds or domes. 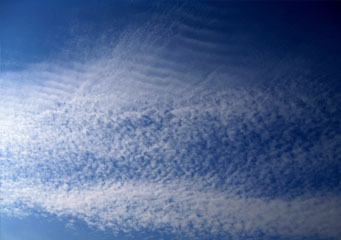 Some cumuliform clouds are stratocumulus, altocumulus and cirrocumulus. Therefore, lacunosus is classified into stratocumulus lacunosus, altocumulus lacunosus and cirrocumulus lacunosus. Oftentimes, the most gorgeous looking structures of lacunosus clouds are in the forms of cirrocumulus and altocumulus lacunosus. How is a Lacunosus Cloud Formed? Lacunosus clouds develop due to the sinking cold air parcels and the rise of warm air packets in their place. This occurs when the cool air layer is on top of the warm air layer. Cool air is denser than warm air therefore it will sink downwards forming holes. While the cool air sinks, the warm air rises upward to replace the cooler air forming cloud fringes between the holes. What do Lacunosus Clouds Look Like? This cloud form can be seen arranged in layers or sheets with holes or breaks and relatively thin cloud elements. The edges are more likely ragged, while the holes or gaps are rounded. Overall, the lacunosus clouds look like a giant net or honeycomb up in the sky. How common are Lacunosus Clouds? Lacunosus clouds rarely form although they can develop in almost all parts of the globe. However, they are more often seen in mid-latitude regions like the United States. Whenever you see lacunosus clouds in the sky, take a brief moment to observe and appreciate its beauty as it is a momentary cloud variety that vanishes rather quickly.